if you can make this effect permanent you got a raz - the no duplicates rule. Wait so what happens if you play this after someone plays Saboteur? Does it cancel it and make it 1 mana? Or does it just drop it to 6? It makes it 1 mana. The 2 ATK will make it a minion easily killed without trading. It will slightly delay the opponent because of its 6 health, but this card will usually be destroyed immediately as everyone is well aware of its synergies. So, really just a stall that is easily dealt with. I love the art for this card. Might just be my favorite artwork of the revealed TGT cards so far and I can't wait to see the golden version! My body is ready for this expansion! Sadly you are already before you can make that combo work. I think the card is good against slow decks and not even totally bad against aggro decks as a 2/6 on turn 4. She kinda is the Mechwarper for any inspire deck. Worst counter would be Cabal Shadow Priest. The artwork is nice, very beautiful. It sounds nice but in reality it just seems like overkill. I'm not sure Handlock will change much after this expansion (if at all) but as it stands right now I don't see such a weak card (stat-wise) making it into any list even if it has such an effect on your hero power. There's just no room. I believe, Frost Giant will be staple for Handlock. He will be cost zero most of the time when you play him, because you basically tap every turn as a Handlock, don't you? Also fits the deck mechanic - you can taunt him, shadowlame him as other giants. More giants for Giant Dad, yay! Frost Giant won't, in any case, be a staple for Handlock. It won't replace Molten Giant, for obvious reasons, and it won't replace Mountain Giant, since if you tap a turn, you will reduce Mountain Giant's cost by (2), while FG will be reduced by 1. Also costing 0? No way, while tapping is crucial and core to Handlock gameplay, to do so effectively requires planning ahead, so it's probably not gonna happen. 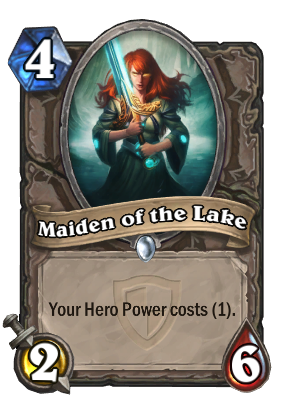 Also FG costing (0) costs (theorically) 20 life, not to mention tapping 10 times (around 20 mana, depends on whether Maiden of the Lake is played or not.). Probably some deck lists might run 1 copy at best, but i don't think Warlock is the class FG is going to see play. Also, no. You don't tap every turn as a Handlock. Yes, you tap A LOT, but knowing when to or not to tap is necessary to play Handlock decently. I didn't said Frost Giant will replace Molted or Mountain. And ofc i know you don't tap EVERY turn literally, but when you play against control decks (meta is already super controlly, and, so far, revealed cards tell us control will be even more powerful) you tap enough to make Frost giant free (or close to it) by turn 15-16 - i can say it by personal experience. Isn't it good enough already? Yeah, i think i've used wrong word. It's not a staple in any case, but definitely one of the rotation slots.